Sun-inspired design combines the practical aspects of saving energy with the delightful characteristics of bright interiors. How a home is oriented and where the windows are placed make a big difference in the energy needed to heat, cool and light a home. The basic concepts of passive solar design also keep the home cool in summer and maximize day lighting year-round. This information and more can be found in The Sun-Inspired House written by the Sun Plan's architect after years designing low-energy, high-performance, passive solar homes. 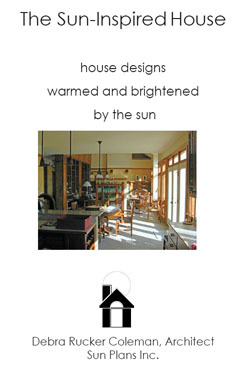 The E-book available from Sun Plans also includes about 150 house plans.